If your FBJC is still a pretty recent occurrence, you’re probably scrambling to figure out what the best course of action will be once you arrive at that first object which is not a 486-foot-tall bridge next to an Outback Steakhouse in Idaho. Even if you’ve been jumping for a little while, you may be left with a lingering feeling that–well–there has to be a smarter way to go about it. Y’know what? There is. To help walk you through it, we talked to a guy who’s really good at being a badass without making surprise visits to the operating room. His name is Trevor Thompson. His CV is impressive enough (Special Warfare Operator 1st Class, Navy SEAL–and, until his recent active-duty retirement, member of the U.S. Navy parachute team), but it’s his BASE experience that we’re interested in here, n’est-ce pas? 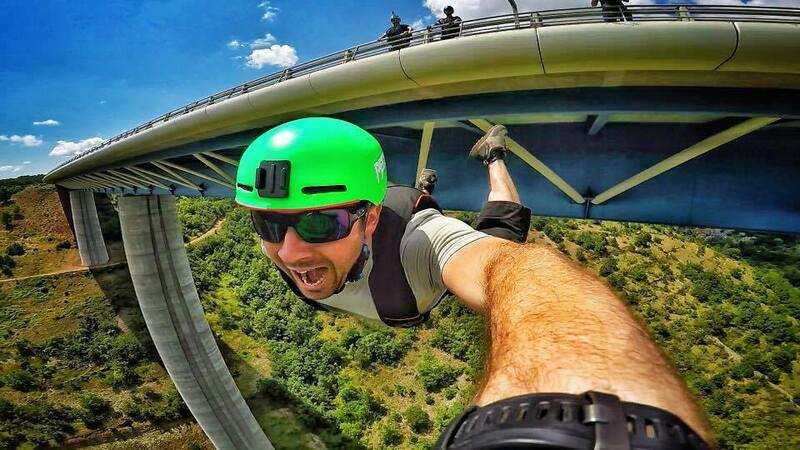 Trevor has been BASE jumping since 2011, and over the course of those years, he has jumped almost 300 different exit points. Here’s what Trevor has to say about evaluating an object that’s new to you–from the first flicker of an idea to the countdown at the exit point. 1. How long have you been jumping? 2. How many jumps do you have? 3. How many jumps do you have at this object? 4. How tall is it? 5. What gear do you jump? 6. What is the exit like? 7. What is the landing area like? 8. What is the allowable weather? Ideal wind conditions and direction? Don’t hold back your own answers. “If you’re a newer jumper, the very best idea is to show up with at least one person who has jumped that specific exit before in the current conditions . At the very least, you need to be there with somebody who has at least been there before and has enough experience to guide you through it. “I almost always carry a laser range finder with me, as well as an anemometer [wind measurement device]. I think it is exceptionally smart to have both all the time. They don’t take up a lot of space. They’re not heavy. They are not expensive. You could probably by a good version of each for $200 or $300 together. Get ready to be your own S&TA. “On a dropzone, you obviously have a bunch of people to ask when you have a question. You have the S&TA, and–probably–pretty credible, experienced instructors around you who have gone through a process where they have had to learn from other exceptionally knowledgeable people. In BASE, you are not going to get that. On a very regular basis, the person guiding you has just kind of felt their way around in the dark in the sport. “You need to be cognizant of your boundaries; of keeping them strong. Let’s say your boundary is that you don’t want to jump a building in winds that are blowing more than 6 miles an hour. But maybe, then, you encounter a stand-alone building with nothing around it that can cause micro weather, but it is blowing 7 or 8 miles per hour. The more you jump, the more you can allow yourself that grey area–but at the beginning, you need to really hold your ground. Define “anxious” separately from “nervous” and pay attention to where you are on that sliding scale. “I take flack for saying this, but for me, any anxiety is exceptional. That perspective comes from a decade of doing a job that was life-threatening on a regular basis. In that job, I was in charge of other people’s well-being, both physically and mentally, and if I fucked up, I would be dead and they would be dead. Build good habits from the start. *The Apex team suggests adding to this list: Clarifying the object’s place on the scale of legality, forming a game plan if you get caught in the act–as well as a game plan for a potential injury or emergency situation. Continuing your education in BASE is the best way to stay safe. To brush up on the skills you’ll take to these new exit points, sign up for an Advanced Course. You’ll be glad you did.